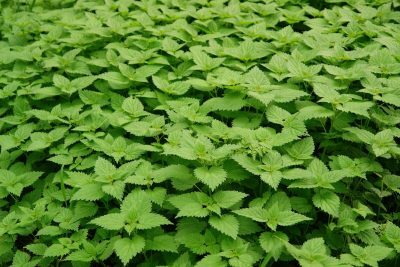 Touted as the “Herb Queen of the Spring” by Mother Earth News, stinging nettle is a nutritious and energy-rich favorite of herbalists. Found in most Northern forest regions around the globe during spring, many people regard this wild edible weed as a useless plant. This humble weed, however, has more value than most people think. For centuries, it has been used by many herbal medicine practitioners to treat a wide variety of conditions, including gout, arthritis, skin disorders, anemia, allergies and asthma, bronchitis, urinary tract infections, sciatica, worms, weight loss, and kidney stones. Next to its cleansing and healing properties, stinging nettle is a nutrient powerhouse. This potent herbal remedy contains high amounts of protein, calcium, magnesium, iron, selenium, zinc, potassium, boron, vitamins A, B, C, D, E, and K, bioflavonoids, antioxidants, essential fatty acids, and chlorophyll. Not impressed? You should be! For far too long the value of this precious weed has been overlooked. But nettle is on its way back. With more people seeking answers to their health issues in nature, they are becoming more aware of nettles’ many benefits and uses. If you are new to using nettles to improve your health, nettle tea and soup are a great way to introduce them into your family’s diet, especially during the spring season. This incredibly versatile and edible plant can be used in many ways to improve your health. If you live in the Northern hemisphere, you might be lucky to find it fresh. If foraging is not possible, dried stinging nettle can be found in both root and leaf form. There is even a powdered version of the leaf available to add to freshly made smoothies and juices. Nettles start to emerge in dense clusters during the beginning of spring. They can grow as tall as five feet and are usually found near a water source. The green or purple-tinted leaves are heart shaped with glassy hairs underneath. It’s these hairs that inject a stinging solution into the skin. This plant’s chemical is a combination of formic acid, histamine, and several other phytochemicals. Luckily, nettles lose their stinging ability when cooked. Always make sure to collect nettles from a clean and toxin-free environment. Nettles taste at their best when they are harvested in early spring. The new leaves at the growing tip are the ones you should aim for. While you can still collect leaves from older plants, according to Off The Grid News, they will not be as tender and sweet. As their name suggests, it is best to wear gloves and a long-sleeved shirt to harvest the leaves. Hold the growing tip and cut the stem just below. Store them in a plastic bag or container in the fridge. They will last for several days. To preserve their quality, you shouldn’t wash the leaves before storing them in the refrigerator. While stinging nettle tea and soup are the most popular dishes, nettles can be used for so much more. Blanch stinging nettles for 5 minutes in water, keep the water for tea. Blanched nettles can be used as an alternative to spinach in many dishes. Stinging nettle pesto is another great option, or why not try to dry some in a food dehydrator or oven for the colder months. Dried leaves can be used as a garnish, or they make an excellent healing tea.